Discover cool spaces, re-imagined historic buildings and neighborhoods with Lexington&apos;s special mix of the traditional and the trendy. Eat, drink, shop and party in these interesting areas of town. Chevy Chase. This neighborhood features one of the oldest and most beloved shopping districts in Lexington. Stop in at the no-frills Chevy Chase Inn, known locally as CCI: the oldest continually operating bar in Lexington. This area&apos;s proximity to the University and downtown ensures that you&apos;ll find a vibrant mix of college kids, neighborhood residents and visitors in the stores and restaurants. Food options range from an ice cream parlor to burgers and pizza to fine dining. Numerous small cottages have been repurposed as retail shops. Distillery District. Lexington played a significant role in the early history of Bourbon. The current Distillery District sprang up around the remaining buildings of historic distilleries on the west end of downtown. A music hall, special event spaces, art galleries, an ice cream lounge, distilleries, craft beer breweries, bars and restaurants are all in full swing, making this part of town one of the most popular hubs for nightlife. Lexington&apos;s food trucks seem to gravitate to this part of town. East End. 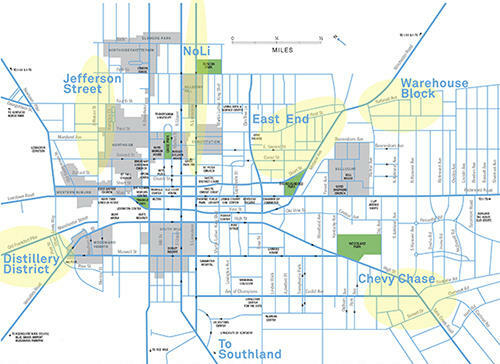 This area includes Thoroughbred Park, the Isaac Murphy Memorial Art Garden and the historic Lyric Theatre. Interestingly, as a neighborhood, the East End developed after the Civil War as a place where freed slaves could purchase homes ranging from stately mansions to modest shotgun houses. Lexington&apos;s Legacy Trail, a multi-use walking and biking trail, connects the East End through downtown all the way to the Kentucky Horse Park near Interstate 75. Jefferson Street. When you hear "Jefferson Street," think "restaurant row." Start at the Main Street end and wander past restaurant after restaurant occupying former homes and commercial buildings from the 19th and early 20th centuries. Pizza? Steak? Poutine? Tapas? Barbeque? Smoked meats? Yes, all that and more. At the end of Jefferson Street you arrive at "The Bread Box" the former Rainbo Bread factory building that now houses a dazzling array of creative projects, included an indoor urban farm and a craft brewery. NoLi. The North Limestone corridor is historically one of the most diverse areas of the city. It is a hub for arts and culture and home to some of the best restaurants and bars in Lexington. Residents of the street have always represented a wide range of personalities and occupations with artists, factory workers, shop owners, bar keeps and clergy all co-existing in this mix of commercial and residential properties. Don&apos;t miss the monthly Night Market: always on a Friday evening. Southland. A commercial stretch of stores and restaurants with a 50&apos;s retro style. Go bowling, play sand volleyball at Marrika&apos;s or pickup an edible Kentucky souvenir at Old Kentucky Chocolates. If you are a musician, you&apos;ll enjoy stopping in at a variety of shops selling musical instruments and sound equipment. Salons and wellness centers, a pet store, bakeries and more round out this eclectic grouping, proving that Lexington&apos;s first shopping center is still thriving today. Warehouse Block. Celebrate local food, local vendors and live music at the annual block party. Anytime of year, head down to this area to discover new ideas for home decorating, take a fitness or wellness class, shop for hand-crafted jewelry, challenge yourself and a group of friends at The Breakout Games, grab lunch or dinner, or enjoy a locally crafted beer. One of Lexington&apos;s two (!) professional ballet companies makes its home in the Warehouse Block.